The provisions of this chapter are intended to: provide a mechanism to promote the educational, cultural, economic, and general welfare of the community; provide an opportunity to reclaim the waterfront heritage setting and to guide development in a direction that strengthens a relationship with that setting; and guide the construction of private and public development to evoke the architectural styles which existed in Empire from the mid-to-late 1800s. Common architectural styles of the time period include Cascadian rustic, plank styles, false front, salt box, Queen Anne and Victorian. [Ord. 503 § 1 (Exh. B), 2018; Ord. 473 § 3 (Exh. A), 2016. Formerly 17.265.010]. (1) The design area includes lots or parcels abutting Newmark Avenue or any portion of a structure that is contiguous to a structure located on a lot or parcel abutting Newmark Avenue. The design area extends west along Newmark Avenue from the intersection of Ocean Boulevard to Empire Boulevard. 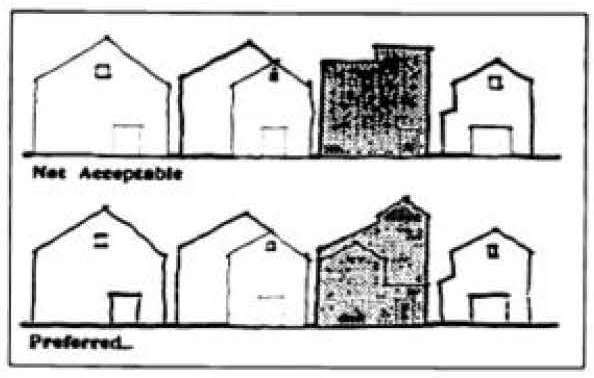 All development must comply with design requirements of this chapter. (2) For commercial uses and the purposes of this chapter, “development” is defined as any new structure or an extension or increase in floor area or height of an existing structure, or change to the style, signage, color, window (size/pattern/material), siding or detailing on the exterior of any existing building. Alterations to a structure are considered development when there is a change in design, material or external appearance. (3) The provisions of this chapter shall not prevent construction, reconstruction, alteration, restoration, demolition or removal of any building or portion of a building when the building official or fire marshal determines that such an emergency action is required for the public safety due to an unsafe or dangerous condition. (4) Ordinary maintenance or repair of the exterior of a structure that does not involve a change in design or external appearance is exempt from design review. Use similar or like materials for the maintenance or repair. Examples of maintenance include, but are not limited to: replacing a window with the same type of glass, framing material and style of window or replacing siding in disrepair with siding of the same or similar material. Exterior alterations which involve replacement with dissimilar materials and/or any new construction, that is not visible from Newmark Avenue, are exempt from design review. (5) The director shall review the application of exterior paint color or stain visible from Newmark Avenue. The director shall only approve colors selected from or similar to the community services historical color palette the department maintains. During a 12-month period, if less than 10 percent of the paintable wall area visible from Newmark Avenue is to be covered with the building’s existing paint color or stain, approval of the color is not necessary. [Ord. 503 § 1 (Exh. B), 2018; Ord. 473 § 3 (Exh. A), 2016. Formerly 17.265.020]. The architectural design review goals and standards are intended to supplement the development standards of the commercial zoning district. Where the provisions of this section conflict with the provisions of the zoning district, the stricter shall apply. “Historical Buildings of Empire and Front Street,” a notebook of photographs from the historical time period, is available for review at the community services department, planning division. (a) Architectural design review goals are the conceptual framework establishing the underlying objectives to be achieved by development in the design area. Architectural design review standards are the approval criteria developed to implement the architectural design review goals and used to review development. (b) Architectural design review standards are mandatory approval criteria used in the design review process. The review authority shall approve a design review application if it finds the proposal clearly complies with the applicable architectural design review standards; provided, however, the review authority may waive one or more of the architectural design review standards during the design review process if the applicant clearly demonstrates the proposal satisfies the architectural design review goals for the design area. 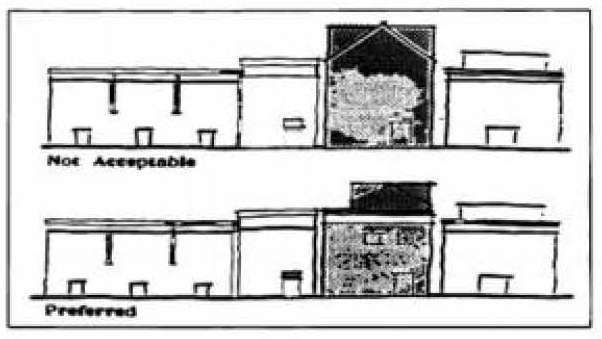 (c) The review authority shall consider factors such as the architectural style of the proposal; compatibility with scenic values and architectural resources in the design area; design quality; structural placement; dimensions; height; bulk; lot coverage by structures; exterior appearance of the building; open areas; and landscaping. (v) Buildings should have consistent visual identity from all sides visible to the general public from Newmark Avenue. (ii) Finish materials, details and colors should evoke the designated historic styles and period. (c) Signage. 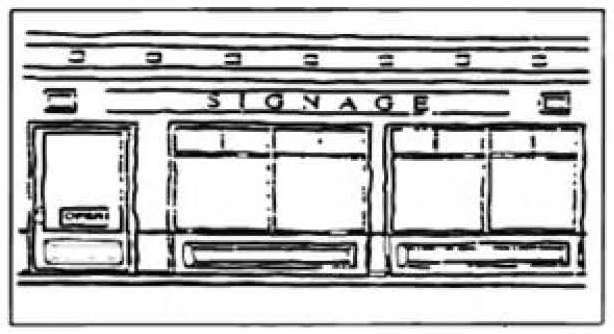 Design for signs should emulate signage that existed during the designated historic period. The pattern and proportion of windows, doors and other glazed areas is important in determining the building’s architectural character. Rooflines can reinforce the architectural character of a street. Architectural features like cornices can relate to adjacent buildings, lowering the apparent, conflicting height of the building. (vii) Flat roofs are permitted with detailed stepped parapets. (viii) The facade must be designed to emphasize the center or primary entrance(s). (ix) Continue exterior materials, architectural detailing, and color scheme around all sides of the building visible to the public from Newmark Avenue. Buildings must present an equivalent level of quality of materials, detailing and fenestration on all sides visible to the general public from Newmark Avenue. (x) Reserve bright colors and black for trim or accents unless it is consistent with the architectural style. (xi) Use of reflective exterior materials where glare would shine into nearby buildings is prohibited. (i) Vary and articulate facades to provide visual interest to pedestrians. (ii) Buildings should use wood or simulated wood products as their exterior finish material on elevations exposed to view from locations accessible by the public. (iii) Do not use plain plywood or grooved plywood panels as exterior finish materials on elevations exposed to view from locations accessible by the public. (iv) Do not expose concrete or concrete block to view as exterior finish materials except for foundation walls not extending more than one foot above the finished grade level adjacent to the wall. (v) Metal siding is prohibited for exterior walls. (vi) The design, detailing and trimming of the rooflines, porches, windows, doors and other architectural features should be in a manner that is in keeping with the designated historic styles. (vii) Glass should be clear, lightly tinted or ornamental stained glass. Use translucent glazing only for restrooms. (viii) Roofing materials exposed to view should be wood shingles, composition roofing, or wavy corrugated metal roofing (rather than bold rib, box rib or v-beam) in a subdued color that is in keeping with the historic styles noted. Decorative features such as cupolas, cresting, chimneys, barge (rake), and soffit/fascia trim are encouraged if it is consistent with the architectural style. (ix) Integrate light fixtures with architectural elements. Decorative light fixtures that are in keeping with the historic styles are encouraged. (x) Exterior light fixtures must not compete with city-furnished sidewalk period lights. Building lights should be metal halide or incandescent and are to be directed away from pedestrians and street traffic so as to avoid glare. Body and trim: HC 40 – 51 and 64 – 75. Body and trim: HC 85 – 87, 103 – 107 Downing Sand, Stone, Earth (100 Years of Color). Body color: Colonial Revival series (100 Years of Color). Also, HC 4 – 6, 31 – 33, 114 – 120, 127 – 132, 138 – 153, 162 – 165, 169 – 174, white. “Painted Ladies” palette. Rookwood series palette (100 Years of Color). Body color: all of Ben Moore HC palette except: HC 40, 49 – 51, 61 – 73, 85, 100, 101, 103, 106, 121, 124 – 126, 133 – 135, 154 – 160. Note: HC = Historic colors from Benjamin Moore Paints. (5) Signage Standards. The standards below are in addition to the standards in Chapter 17.333 CBDC, Signs. If the provisions conflict, the stricter shall apply. A sign permit is required. 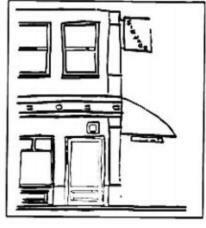 (a) Signs must be consistent with the character of the facade, the building on which they are situated and the abutting and adjacent area. Review for consistency includes, but is not limited to, evaluation of size, shape, position, materials and illumination in relationship to the facade and abutting and adjacent developments. (v) Be related to the style and character of the building or area. (i) Wall/Fascia Sign. A “wall/fascia sign” is defined as the vertical surface of a wall/fascia which is suitable for sign attachment. A wall/fascia sign must not extend across two storefronts or across separate buildings. (ii) Projecting or Hanging Sign. A “projecting or hanging sign” is defined as a sign whereon the message area is displayed perpendicular to the building facade. (iii) Awning Sign. An “awning” is any structure made of fabric or similar material with a painted metal frame which is attached to a building and projects over a public walkway. An awning shall have no soffits, plastic components or internal lighting. Plastic awning fabrics are prohibited. 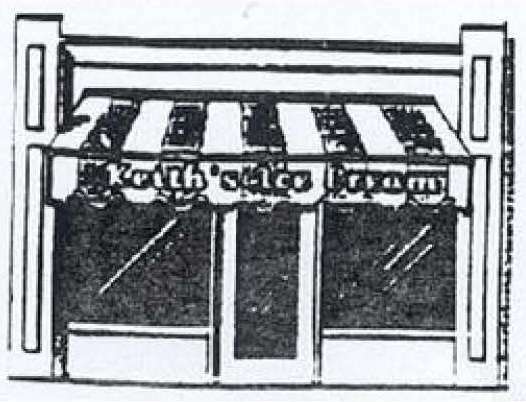 Advertising material attached to an awning is an awning sign. (iv) Roof Sign. Any sign that is displayed upon or supported in any way by a roof. (A) Roof signs are discouraged. 2. Not project above the roof ridge line. (v) Marquee Sign. A “marquee sign” is defined either as a fascia sign or a projecting sign or awning sign which contains movable letters or devices. A marquee sign shall not contain any plastic parts and shall not be internally illuminated. (vi) Interior Painted Window Signs. These signs are regulated. However, interior painted window signs with holiday themes are allowed for up to 45 days without approval of a sign permit. (vii) Miscellaneous. In addition to the above sign types, other types of signing may be appropriate if it meets the criteria listed in this subsection (5). (viii) Neon signs (any sign where neon or other gas contained in tubing is illuminated by the application of electric current) are prohibited. (ix) Pole-mounted or freestanding signs are subject to review. (x) Sandwich board signs are prohibited. [Ord. 503 § 1 (Exh. B), 2018; Ord. 473 § 3 (Exh. A), 2016. Formerly 17.265.030].